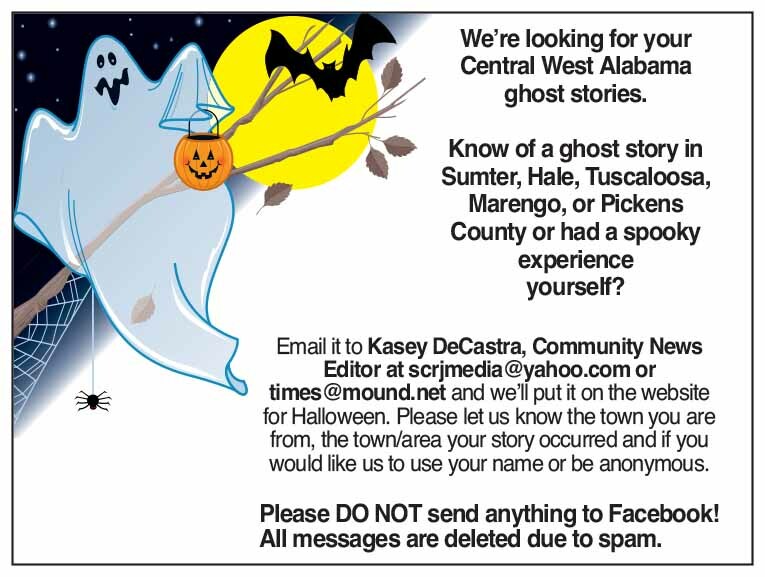 We’re looking for your Central West Alabama ghost stories. Know of a ghost story in Sumter, Hale, Tuscaloosa, Marengo, or Pickens County, or had a spooky experience yourself? Email us at scrjmedia@yahoo.com or times@mound.net and we’ll put it on www.recordjournal.net and www.moundvilletimes.net for Halloween. Please let us know the town you are from, the town or area your story occurred and if you would like to use your name or be anonymous. PLEASE DO NOT SEND ANYTHING TO FACEBOOK! Whether you’re a ghost or zombie, vampire or witch, poor costume choices—including decorative (colored) contact lenses and flammable costumes—and face paint allergies can cause injuries that haunt you long after Halloween. • Wear costumes that say “flame resistant” on the label. If you make your costume, use flame-resistant fabrics such as polyester or nylon. • Wear bright, reflective costumes or add strips of reflective tape so you’ll be more visible; make sure the costumes aren’t so long that you’re in danger of tripping. • Wear makeup and hats rather than masks that can obscure your vision. • Test the makeup you plan to use in advance. Put a small amount on the arm of the person who will be wearing it. If a rash, redness, swelling, or other signs of irritation develop where the makeup was applied, that’s a sign of a possible allergy. • Vibrantly colored makeup is popular at Halloween. Check FDA’s list of color additives to see if the colors are FDA approved. If they aren’t approved for their intended use, don’t use them. This is especially important for colored makeup around the eyes. • Don’t wear decorative contact lenses unless you have seen an eye care professional for a proper fitting and been given instructions for how to use the lenses. Eating sweet treats is also a big part of Halloween fun. • Eat a snack before heading out to avoid the temptation of nibbling on a treat before it has been inspected. • In case of a food allergy, check the label to ensure the allergen isn’t present. Tell children not to accept—or eat—anything that isn’t commercially wrapped. • Parents of very young children should remove any choking hazards such as gum, peanuts, hard candies, or small toys from the Halloween bags. • Inspect commercially wrapped treats for signs of tampering, such as an unusual appearance or discoloration, tiny pinholes, or tears in wrappers. Throw away anything that looks suspicious. • Unpasteurized juices and juices that have not been further processed are at higher risk of food- borne illness. Look for the warning label to identify juice that hasn’t been pasteurized or otherwise processed, especially packaged juice products made on site. If unsure, always ask if juice has been pasteurized or not. Normally, juice in boxes, bottles or cans from your grocer’s frozen food case, refrigerated section, or shelf has been pasteurized. • Before bobbing for apples—a favorite Halloween game—reduce the risk of bacteria by thoroughly rinsing the apples under cool running water. As an added precaution, use a produce brush to remove surface dirt. Although unauthorized use of decorative contact lenses is a concern year-round, Halloween is the time when people may be inclined to use them, perhaps as costume accessories. When they are bought and used without a valid prescription, without the involvement of a qualified eye care professional, or without appropriate follow-up care, it can lead to significant risks of eye injuries, including blindness. October is here and that means children everywhere will be getting ready to gorge onand stockpile candy from Halloween. This also means that parents and dentists everywhere will be looking for ways to regulate candy consumption. The Alabama Department of Public Health (ADPH) Oral Health Branch, through creative collaboration and partnership, is dedicated to making sure resources are available to help educate parents and children on ways to prevent dental decay. For that reason, here are a few tips from the American Dental Association to make sure this year’s Halloween candy haul is cavity free. Timing is everything with most things in life, and choosing when to eat Halloween candy is no different. Saliva production increases during meals, which helps to cancel out acids produced by bacteria in the mouth. Choosing to eat sugary snacks with meals or shortly after mealtime can help reduce the effects of tooth decay due to this increase in saliva. Multiple sources such as the World Health Organization, Centers for Disease Control and Prevention, and the American Dental Association support proven studies that drinking fluoridated water can help prevent tooth decay. In most cases, tap water is preferred to bottled water because it guarantees the consumption of fluoride as an oral health measure. Avoid candies that stick to teeth, like taffy and gummy bears. Sticky candies take longer to get washed away by saliva which means there is a greater risk for tooth decay. The buildup of plaque that causes gum disease takes just 24 hours to develop. Brushing and flossing teeth in the morning and at night before bed will help prevent the onset of tooth decay. Remember to replace your toothbrush every three or four months. Every child should be able to experience the joy and tradition of trick-or-treating on Halloween. But kids with food allergies are often left out of the fun, since most candy is off limits. FARE’s Teal Pumpkin Project helps make sure all children will come home on Halloween night with something they can enjoy. It just takes one simple act: offering non-food treats, such as glow sticks or small toys, as an alternative to candy. Last year, households from all 50 states and 14 countries participated. This is a worldwide movement to create a safer, happier Halloween for all trick-or-treaters. Can I still pass out candy? Sure – just do it safely! The point of the Teal Pumpkin Project is to make trick-or-treating as inclusive as possible. You can keep the experience safe by keeping your food treats and non-food treats in separate bowls. The Teal Pumpkin Project was inspired by a local awareness activity run by the Food Allergy Community of East Tennessee (FACET) and launched as a national campaign by FARE in 2014. FARE thanks FACET for their ongoing partnership as we work to reach families across the country and around the world with the Teal Pumpkin Project’s messages of awareness, inclusion and community. For more information visit http://www.foodallergy.org/teal-pumpkin-project. This mansion turned library turned tourist attraction/wedding venue is said to be haunted. Visitors report cold spots, strange feelings and an eerie “presence”. It was one of the first houses of its time to have running water and a coal heating system. Robert Jemison Van de Graff, Jr. built the home in 1859. He was a state senator and the inventor of the Van de Graaff generator. It is believed that Mr. Van de Graaff’s daughter, Priscilla Cherokee and her husband, Andrew Coleman Hargrove, haunt the house. Mr. Hargrove suffered for years from an incurable headache caused by a bullet wound to the head. Eventually he could no longer take the pain and shot himself in the home’s library. Priscilla was distraught over her husband’s suicide and fell into a deep depression and wild hysteria. After eight years of such suffering, she died. People claim to see lights in the mansion when no one is there and there are also reports of the tower being engulfed in ghostly flames. Several tragedies befell the Drish family including suicide, murder and insanity, all within two generations. The first tragedy within the family was that of daughter Katherine. Katherine was forced to marry a man her father chose for her instead of the man she truly loved and became deeply depressed after the wedding. Her husband, unable to handle his wife in this condition, returned her and their two young boys to the mansion. He divorced her soon thereafter. Katherine could never function properly afterward and had to be locked in her room at night and followed about during the day to ensure that she didn’t hurt herself. Dr. Drish had a penchant for drinking and gambling and soon drove his family to the brink of ruin. One evening, as he was suffering from delirium, he ran from his bed and headed towards the staircase. He fell halfway down the stairs and died. One of the most interesting stories about the old mansion, however, is that of the ghost fires. A custom, at the time, was to place candles about the room where a body was laid to rest. Dr. Drish’s wife Sarah conducted this ceremony for him and put the candles in a drawer with the hope that they would be lit for her as well when she died. Her ceremony was forgotten. One evening after her death, the slaves on the grounds noticed that the tower was on fire and called for the fire crew. When the crew arrived the flames had disappeared, along with any sign of having burned. Once the fires disappeared, so did the ghost of Mrs. Drish. Beloved niece, Helen Whiting’s husband was jealous of her beauty and popularity. One morning, he attacked her in the bathroom and slit her throat. He spent several years in a mental institution before he was released. After his release he became a wealthy railroad tycoon. The workers in the Drish mansion refused to touch any of the things that Helen had left behind, believing that they were haunted. One of the rooms is supposedly haunted by a girl who used to live there. Although this haunted spot can be found on most ghost websites, there are very few accounts to be found. Reportedly the bathroom taps turn on by themselves and doors slamming. A former insane asylum with a reputation for treating its patients cruelly (especially black patients of which there were a disproportionate amount), this place is an obvious choice for claims of haunting. People claim to feel hot and cold spots, see items moving and hear ghostly sounds and footsteps. At these historic Native American mounds, reports say, ghostly drums may be heard at night and lights may be seen coming from one of the larger mounds that looks like a pyramid. We felt we couldn’t leave out Gaineswood since it’s so close to home. A young woman who died while visiting the plantation is said to haunt Gaineswood. angry that she was not promptly returned to her home state for burial. Her anger must not be too great however, as she mostly expresses it by playing the piano, tickling the ivories and visitor’s fancies with long-forgotten melodies. The house was built on old slave quarters. It was said to have a cemetery under the house. Things have moved and noises with no known source heard. Carrollton, Alabama was visited on April 5, 1865 by troops of Union General John T. Croxton. The visit from the troops left Carrollton without a commissary or a court house, both of which were torched, burned. Having no military value, it is still to this day not known why such an action was ordered. Less than twelve years later, Carrollton faced another devastating loss. A second court house was burned. This time it was not the work of military, yet it was done by a local man, Henry Wells, on November 16, 1876. No arrest was made until January of 1878. Henry Wells, an African-American man with a criminal background was the suspect. Law enforcement (the sheriff) placed Henry Wells into the newly built courthouse, erected in 1877, after arresting him. Wells was placed in the garret, hoping this would keep the angry mob from reaching him. “I am innocent. If you kill me, I am going to haunt you for the rest of your lives!”, cried out Henry Wells. Lightning struck the window pain just after he had made this comment. His face was pressed against the glass as this happened. Legend states that the mob did catch Henry Wells and that he was indeed lynched. Townspeople were upset that their treasured courthouse had been destroyed. Washing the window with gasoline nor scrubbing with soap will erase the face of Henry Wells. A hail storm in 1929 is reported to have broken all windows in the courthouse except for the one showing Henry Wells’ face. During thunderstorms it is said that Henry can still be seen peering out of the window as though if really there in the flesh. Whatever the rumors about this man may be, there is an image of his face on the window. Different stories yield different versions of the real death of Henry Wells. Stories told over the years tend to make exaggerations and leave out parts and add parts where one deems necessary. As though looking into two mirrors facing one another you can see for what seems like “forever”; Henry Wells still looks down from the courthouse window. One hundred and fifty years have passed and still he is there. For this story I have read his biography, every news article I could find, and interviewed Dr. Alan Brown, and even had him take me on a tour of Livingston to show me the locations of the events I will tell ya’ll about and film. I will give you what facts I have and some of the myths surrounding him. Fact: Stephen S. Renfroe was originally from Georgia. His Family moved to Butler County, Ala. when he was young. During his young adult life he was a farmer, a Civil War veteran, a sheriff, a politician of sorts, and high ranking member of the Ku Klux Klan. His criminal endeavors are as such: he was implicated in over a dozen murders (with 5 of those having multiple witnesses) (it was like the “Old Wild West,” just down south), he was a thief of multiple horse and mule, he broke into many homes to steal valuables then set fire to said homes, set fire to a government building(he burnt down Livingston’s old wooden court house to cover up one of his murder charges), kidnapped and held hostage a news reporter that was trying to find info on him, and embezzled money from county and city funds (which he died while he was Sheriff here in Livingston). He was never convicted of any of this. There was not a funeral or ceremony of any kind. Being that he was an outlaw he was not granted burial inside Livingston cemetery. He was buried just outside Livingston cemetery, by the railroad tracks, in an unmarked grave. Shortly after the area became an unofficial “trash and waste dump.” Some years later a headstone appeared in a cemetery off Old Cemetery Road that read, “Here lies Stephen S. Renfroe Sumter Counties Notorious Outlaw Sheriff.” It was placed in between 2 of his 3 wives headstones. So, because of the unmarked grave, the trash pit, and the random appearance of the new headstone on the other side of town(almost in Eppes) some people are of the opinion that it can not be know of Stephen S. Renfroe’s final resting place. Some believe he simply may be at the bottom of the Sucarnochee. Myths/Ghost Stories: On the date of his death people have claimed to see him flying/floating in the night adorned in a white robe, riding his white horse, with a green hue about him. If you can locate the tree that he was hung from, then knock on the tree while you say “Renfroe, Renfroe, What did you do?” The tree replies “Nothing!” Seriously, I’m not making it up. The old Bibb County Jail hasn’t been used since 2000. It’s said to be haunted by former inmates. Captain Norman Staples, was buried in Bladon Springs Cemetery alongside the graves of his three children who died before the age of six, including Bertha Jaquetta, Mabel Clare, and James Alfred. He watches over the graves of his children, looking toward the Tombigbee River, where his steamboat exploded. The apparition of the ghost ship of the Eliza Battle, which burned on the Tombigbee River in 1858 killing more than 30 people, appears on the Tombigbee on cold nights. Thornhill was built in 1833 by James Innes Thornton and is listed on the National Register of Historic Places. Urban ledgends claim the home’s elevator shaft was really a gallows where people were hanged. Claims are the home is said to be haunted by spirits of those supposedly hung in the shaft.